The active use of strong steroid drugs often leads to aromatization, which adversely affects the state of the body. Modern sports pharmacology allows using safe methods to suppress aromatization, eliminating side effects. 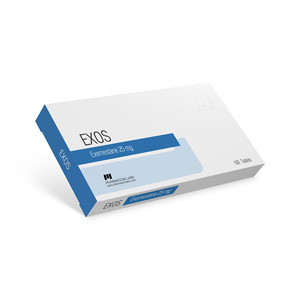 One such tool is Exos from a reputable manufacturer Pharmacom. Most often, after a course of drying and weight gain, body makers, athletes and powerlifters decide to buy Exos 25 mg (exemestane). The main active ingredient in Exos is exemestane, which is a known aromatase inhibitor. Its use is safe and available to all who play sports or simply train in the gym. Why is it important to take aromatase inhibitors during PCT? Taking pills allows you to significantly reduce the amount of estrogen in the blood, thereby preventing spikes and drastic changes in hormonal levels. This prevents the occurrence of side effects and diseases. prevention of feeling unwell on steroids courses. Despite the huge number of positive properties, the drug is not completely harmless. People who suffer from cardiovascular diseases are not recommended to take pills. Before buying Exos, many people have a question – can the pills themselves cause side effects? With the adherence to the rules of admission and the absence of individual intolerance, extremely rarely there is a negative impact on the body. Exos does not affect the synthesis of cortisol and does not violate hormonal levels.